Early Music Shop 19 Inch Medieval Snare Drum & Sticks. Designed by The Early Music Shop (EMS), UK of Bradford England. This cylindrical drum has two heads, one with a snare. When the drum head is struck with the drum sticks, the snare adds a vibration, or rattle, to the drum's din. The Medieval style drums are made with two, rope tuned, skin heads that are rolled and stitched with the snare on the top head. 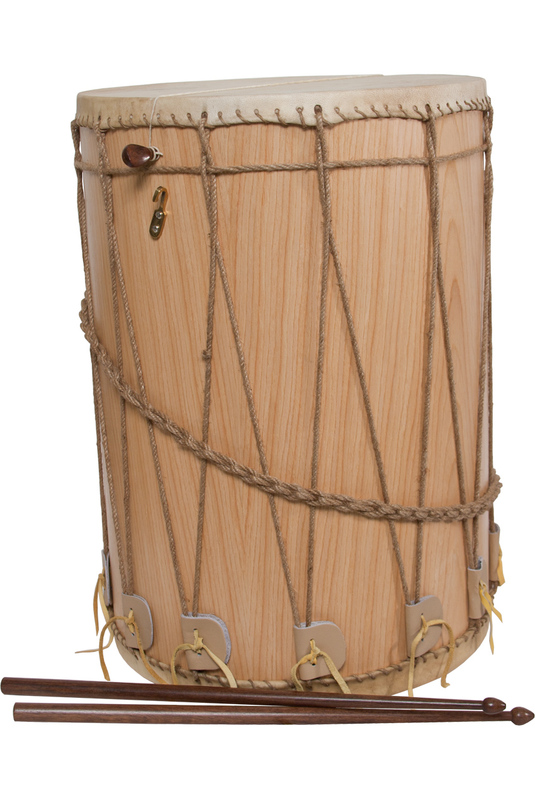 This style of drum is a traditional military drum with a long history. They were used to mark time for marching or to signal during confrontations. In England during Renaissance, side drums like this were known as a tabor. In England, the shallow tabor, associated with the American war of independence, is sometimes called a tom tom. In France, during the 18th century, they were known as tambours , or tabret, and were well associated with the political resistance and rebellion against the French monarchy. 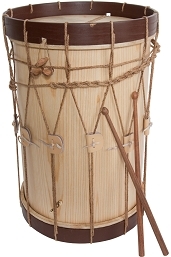 As a military instrument this drum was often used in combination with a Wooden or metal pipe. Both instruments were played by one individual, like a one-man-band. The 3-hole pipe was held and played with one hand, while the other hand held the drum stick and played the tabor which hung from the wrist, shoulder, or arm. Such snare drums were used in military bands until the 19th century, when it became an orchestral instrument. 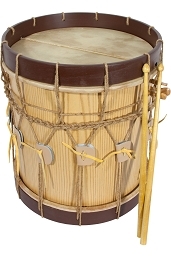 Today this style of snare drum is used in parades and processions. Originally such drums were fashioned from solid timber making them quite heavy. These modern replicas are fashioned from attractive half-inch laminates for strength and light-weight. Each drum comes with 2 drum sticks. There is a brass hook to help suspend the drum from your belt or strap while playing.